Matthew is haunted by his past, and Charlotte is fearful of her father’s renewed meddling in her future. After a disastrous first meeting, can they help each other find happiness at last? Many of my stories will have some characters in common, although each will be stand-alone and the stories can be read in any order. The series is named after the 9th Earl of Marstone, who plays a part in all the stories. 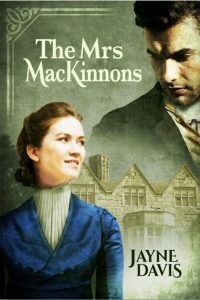 Although the 9th Earl appears in The Mrs MacKinnons , it is a very minor part, so that book is not really part of the series. 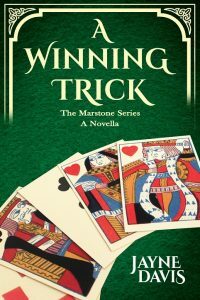 Book 1 of The Marstone Series, now available on Kindle (paperback coming soon), or read free on Kindle Unlimited. A duel. An ultimatum. An arranged marriage. Will, Viscount Wingrave, whiles away his time gambling and bedding married women, thwarted in his wish to serve his country by his controlling father. News that his errant son has fought a duel with a jealous husband is the last straw for the Earl of Marstone. He decrees that Will must marry. 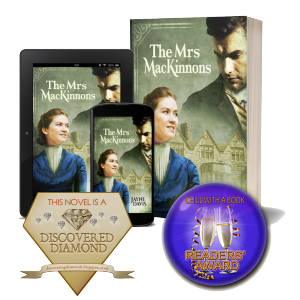 The earl’s eye lights upon Connie Charters, unpaid housekeeper and drudge for a poor but socially ambitious father who cares only for the advantage her marriage could bring him. Will and Connie meet for the first time at the altar. But Connie wants a husband who will love and respect her, not a womaniser and a gambler. Their new home, on the wild coast of Devonshire, conceals dangerous secrets that threaten them and the nation. Can Will and Connie overcome the forces against them and forge a happy life together? 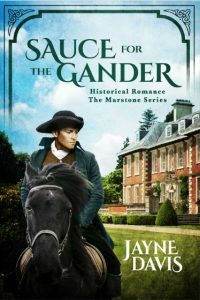 A 20,000 word novella, an extended epilogue for Sauce for the Gander. set three years later. This will be free, exclusively for readers on my mailing list (join here if you’re not already on it). Available early April 2019. This one is just an idea at the moment, and I’m not even working on draft 1! 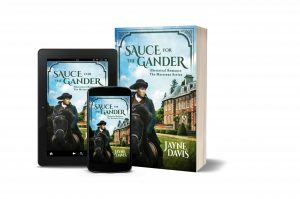 Phoebe Deane is the poor relation in the Calvac household, unwillingly accompanying her aunt and cousin on a journey into revolutionary France. Now France has declared war on England, they need to get home as soon as they can. Her aunt’s imperious manner almost gets them arrested, but a fellow traveller comes to their aid. Alex works alone and uses many names. An impulse leads him to help the red-head and her family, but can he get them to the coast without endangering himself and his mission? The story of a young woman using her wits and courage, gaining the confidence to choose the life she wants for herself. This one is almost ready, but won’t be published until Sauce for the Gander and Book 2 in the series are ready. However if you can’t wait, and fancy being a beta reader* for it, get in touch via my contact page. *Beta readers read manuscripts before they are finalised. In the case of Playing with Fire, you would be getting a near-final version of the story, but it will not have been copyedited, so there may be some typos and other small errors. The feedback I’d like can be anything from whether or not you liked it, to reactions on each chapter. Particularly helpful are comments about any parts of the plot you did not understand (so I can explain it better), inconsistencies, etc. What you don’t need to do is to check my spelling and grammar – someone will do that at the next stage.